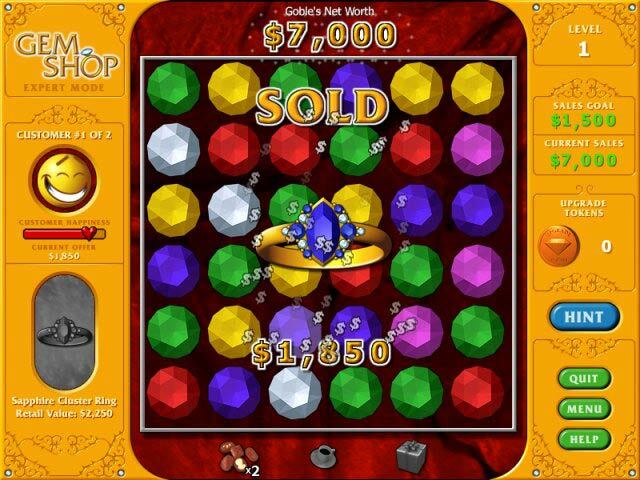 Match colorful gems and keep your jewelry customers happy! Sell gems and jewelry to your smiling consumers, but watch out! Keep them waiting too long and they'll start to grumble. You'll need to give them a marvelous treats to keep them happy (and get the sale)! 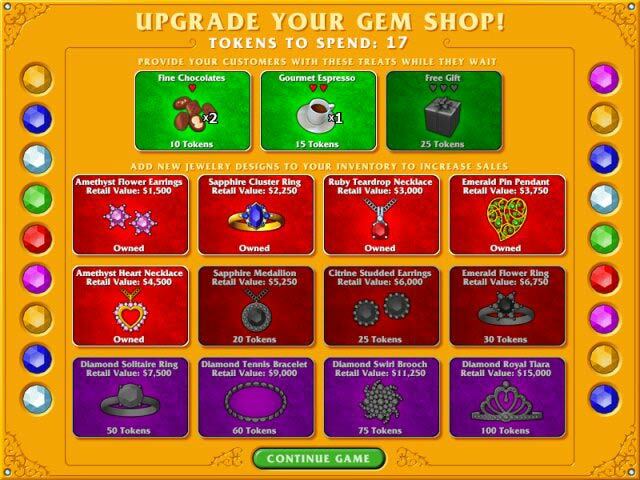 Special tokens allow you to upgrade your shop with more jewelry and customer-appreciation treats. 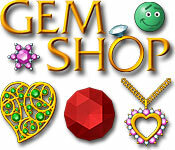 Remember: Happy customers spend big bucks, and keep your gem shop open for business! Match colorful gems to build elegant jewelry. Customize your shop to increase sales. Gem Shop is rated 4.6 out of 5 by 5. Rated 5 out of 5 by thejanith from great slide-to-match game In a world drowning in flip-to-match games, Gem Shop is a SLIDE-to-match game. You slide the rows up & down or sideways to make matches of three or more same-colored gems. Cascades of matches earn you extra points. With the tokens you earn, better jewelry is purchased to sell in your store. You can also purchase customer treats with the tokens. The customers here are not very patient, so you must sell the jewelry quickly or give the customer a treat to make him happy while he waits for you to get the piece of jewelry ready. Rated 5 out of 5 by Reggie1981 from One of My favorites My husband and I both really love this game. It's one that you can play over and over again and never get bored with. We are hoping the creators work on a new version really soon! Rated 5 out of 5 by jcev from adictive match 3 objects game, with a twist I have had hours of fun playing this game. It is very simple but addictive to play. I have spent hours playing and then noticed the time. 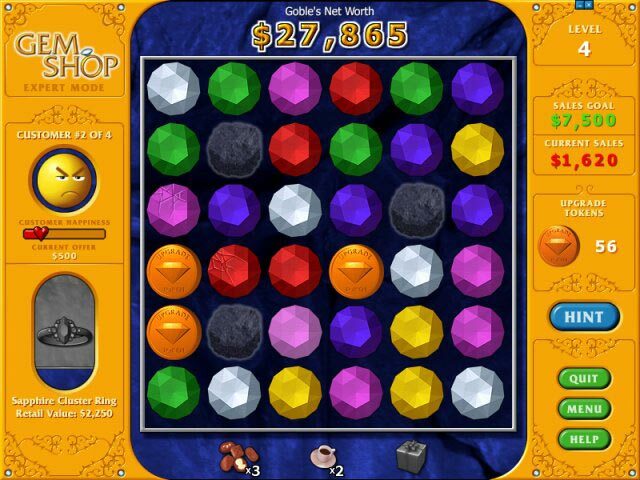 You basically have to match gems of the same colour to earn money to buy jewelry, whilst trying to ensure your customers stay happy. Rated 3 out of 5 by bessiegirl from frustrating Well, I thought when you chose "casual" that is what it meant. Although there is apparently no timer on casual, you do have to beat the daily sales quota which gets higher with every level. You get three tries to do this, if you run out of re-trys your game is over and you have to start a new game. I I get to about level 9 which has a $17,500 quota and can't seem to get past it....which does not make this game any fun for me. Unusual match 3 which gets a bit getting used too. Glad I got it on sale, even then I spent more than I think its worth. Definitely NOT casual game to play. I found that misleading.